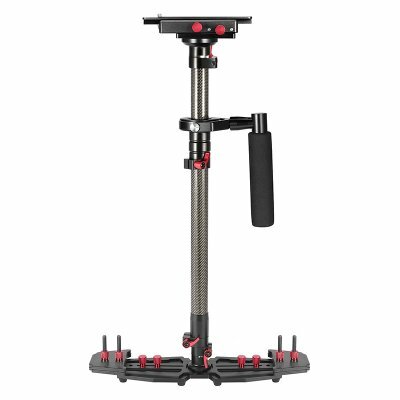 Successfully Added HD2000 Handheld Camera Stabilizer - Adjustable Mounts + Counter Weights, 53-78.5cm, 5-8kg Weight Bearing Capability to your Shopping Cart. Tired of shaky footage that make your videos unwatchable? All you need is the right gear. This handheld camera stabilizer will make sure your video quality is not hindered by a shaky hand, strong wind or other obstacles. This Handheld Camera Stabilizer for Professional Footage Make sure your videos always come out looking just the way you planed them to with the handheld camera stabilizer. Made with light carbon fiber and aluminum alloy and featuring an anti-slip handle, it is a reliable tool for great photography and videography. The camera stabilizer comes with a set of weights that balance themselves out and make sure your footage always comes out solid. With this taken care of, you can now focus all your energy on planning your shots, adjusting angles and more. The camera stabilizer is suitable for most types of cameras, including SLR and DV. Easy-to-assemble and designed to be portable, it's a great gadget for any photographer’s toolbox that accompany you to any shooting location without taking up too much space. It even comes with a nice carrying bag for your convenience. So, if shaky footage has long been a persisting problem, you can now solve it once and for all with no great strain on your budget. The HD2000 Handheld Camera Stabilizer comes with a 12 months warranty, brought to you by the leader in electronic devices as well as wholesale camera stabilizers..
Material: carbon fiber, aluminum alloy.